1 Where do we use bookmarks and why do we need them? 1.1 Bookmarks for Various Roles! 2 How do we create bookmarks? Bookmarks are used to identify unique locations in space so they can be easily returned to. Bookmarks do not need to be associated with an actual in-game object, and are often used to mark locations far from surrounding celestial objects. Where do we use bookmarks and why do we need them? In EVE, celestial objects and star bases are defined by coordinates in our current maps. Other than those locations already defined in astrometry charts, there could be other locations which you may want to save so that you can return later. Bookmarks are used to identify those locations in-game. A miner ship has a limited cargo hold for ore. So, miners usually collect ore in a can and leave it in space. After they deplete the source, they return to their base of operation and come back with a hauler to haul the can. These cans are objects floating in space and if you don’t bookmark their location you cannot return to them and collect your ore. Salvaging is one of the most profitable operations in the EVE universe. During your agent missions, you will probably leave lots of wrecks behind after engagements. A ship fitted with both PvE and salvage equipment will not be an efficient way to complete missions. Most mission runners bookmark their wrecks, complete their missions, and return to bookmarks for salvaging with a dedicated salvage ship. If you are in PvP or military operations, a direct approach to any celestial object could create potential risks. You could end up in a trap, be easily hunted down, and killed. For that reason, there are sets of tactical bookmarks used for this kind of situation. There are also observation bookmarks, safe spots in space, bookmarks for blockade running from a station, and instant warp-out bookmarks. Whether you are a miner, explorer, a combat capsuleer, or just a traveler, you will be in need of bookmarks for various reasons. From the first days of your capsuleer life you could start creating your own bookmarks without needing to train any skills at all. How do we create bookmarks? There are three ways of creating bookmarks. The first is to use the "People & Places" window and go to the "Places" tab. Select "Add Location" at the bottom and you will bookmark the location you are presently at in space. The other way is to either right-click an item in space or on your overview and select “Save Location”. The only difference between these methods is that using the first method bookmarks your ship's current position in space while the second method bookmarks another entity's location in space. You can bookmark cans, POS (Player Owned Station), wrecks, and various site locations found during core probing. You can bookmark many entities in space, but if the location of the item is changed by force or is destroyed, the bookmark will only indicate the original location coordinates. The 'Add location' command works both when you are at a dead stop or while moving - including warping. The coordinates you bookmark will indicate the exact location when you click the 'Submit' button and confirm the bookmark. One exception to the above occurs if you open the 'Add location' window in a station. If you undock and use that 'Add location' window in space, the bookmark will be set at the station and NOT at the point in space you were at when 'ok' was clicked. The third and quickest method for adding a book mark is to use the short cut keys to bring up the "New Location Window". The default short cut for doing this is "CTRL+B" and this only works when in space. The window functions in the same way as going via the "Add Location Button" in the "People & Places" window. Don’t try to write labels and notes in stressful situations - just take the necessary bookmark. The client will give an automatic label to the bookmark. You can even use the same label for different bookmarks. Because their coordinates are different, they won’t overwrite each other. With the release of Phoebe in November 2014 bookmarks now appear in space by default. Personal bookmarks look like a small pin. Corporate bookmarks appear as a small pin with a star on the top. There are many types of bookmarks, but all capsuleers should at least have some basic bookmarks to travel in space safely and avoid traps or hunts. Depending on your role or operation you could extend your repertoire to various bookmarks. An instant warp-out bookmark is used to safely exit a station in hostile space. Pirates or various enemies can "camp" a station's undock location. With the help of various fits they could instantly lock and warp-disrupt/scram your ship. Instant warp-out bookmarks are used to run from these blockades using undock mechanics and a bookmark placed at a distance at least 150 km away from your undock location in a straight direction. When you undock you leave the station aligned to a constant direction moving at your maximum velocity. In theory, if you place a bookmark at least 150 km away aligned to this direction you could warp out almost instantly to this bookmark without being target-locked. There are two ways to create such a bookmark. The first one is easy and (a bit) dirty. You use a fast frigate or an interceptor with a MWD (micro-warp drive) fitted and as soon as you undock hit your MWD without changing your alignment. Put some distance between you and the station - at least 150 km - and take the bookmark of the new location. This is a bit of an outdated method as your direction is slightly random each time you undock. You might not immediately enter warp but have to align a bit first. Most (but not quite all) horizontally undocking stations are aligned directly along one of the 'compass lines' that display when your tactical overlay is active. Adjust your camera so that you're looking almost straight down that compass line (you can't do it directly down one because your ship would be in the way) and double click where that row of numbers disappears into the horizon. That should be the main direction of station undocks, and get you a bookmark you can warp to instantly. On a vertically-undocking station, select the station so it is in your Selected Items box, then a line will display on your tactical overlay showing you exactly where the station is horizontally relative to your position. Once you go off grid this line will disappear, but the bright spot where it intersects your horizontal plain will still be visible even then. Keep flying downwards and adjusting your direction slightly so that the bright spot remains as close to your ship as possible, and you've got yourself a perfectly aligned undock bookmark. Always use different distances for your instant warp-out bookmark. If you use always same distance, they can wait for you there as a trap. Try to create off-grid instant warp-out bookmarks so that you cannot be detected instantly and followed. Always try not to warp at 0 to protect the exact location of your bookmark. Warping to a station never takes you to the exact location where you can dock right away. Sometimes you may have to approach the station a bit closer and wait several seconds between the docking request and the actual docking. This waiting time can be fatal, especially at stations which are likely to get camped, e.g. trading hubs. An instadock bookmark is used for docking nearly instantly after you get out of warp, thus providing you with much more safety. You should create an instadock bookmark by approaching a station and bookmarking your location when you are within a range of 2500 meters, e.g. right after bouncing off the station itself. One such bookmark per station is enough, no matter from which direction you warp in. For a safe instadock, you can then warp to your bookmark and spam the "Dock" button right after you fall out of warp or mark a station as your destination and use autopilot after warping to a bookmark manually. You can find a demonstration video on Youtube: Staying Safe - Insta-Docks. Safe spot bookmarks are one of the most important and creative ways to use bookmarks. Safe spots are locations in space away from all charted entities. The only way to find someone in a safe spot and warp to that location is by using scan probes. Although you can be seen in a directional scan, you cannot be followed unless someone scans your location with probes. There are three basic types of safe spots. 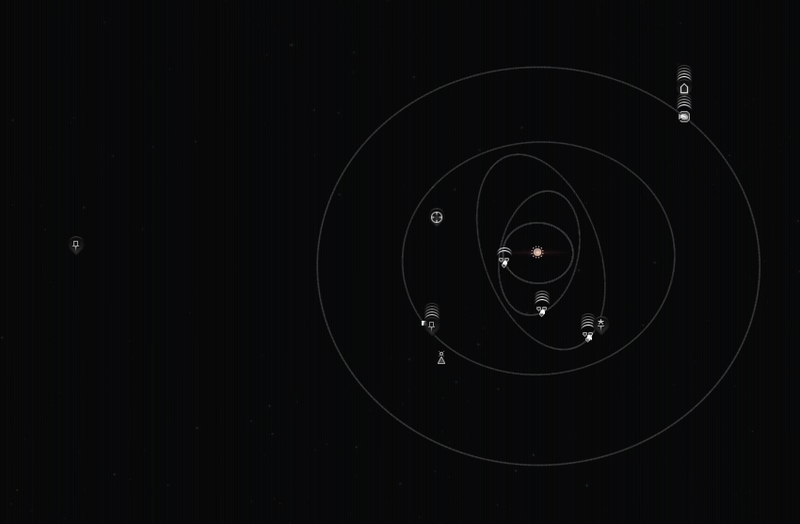 When you are traveling between celestial objects, you can click on 'add bookmark' and take bookmarks while warping. Bookmarks created this way are called mid-point safe spots. It is the basic way to create a safe spot in a system. 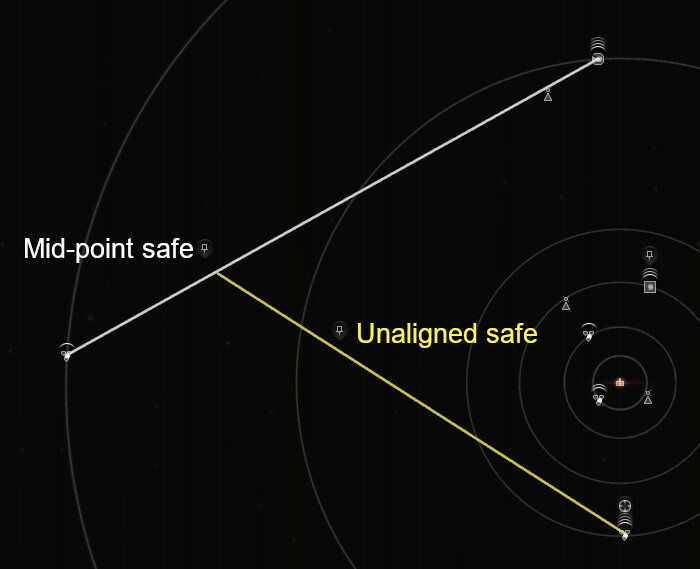 Mid-point safe spots are somewhere between the alignment of two celestial objects and it is easy to spot or find someone at a location like this. The much safer locations are unaligned safe spots. These spots are not in an alignment between two celestial objects. There are two ways to create unaligned safe spots. The first method is to bookmark dead space pockets when you are running missions in a system. Dead space pockets are created randomly and are very hard to find. When you are running missions, always create bookmarks as safe spots. The second method is to create an unaligned safe spot by using two mid-point safe spots. First, create two different mid-point safe spots. Then, create another mid-point safe spot between those two mid-point safe spots. Then you will have an unaligned safe spot. If your safe spot is out of the maximum on-board scanning range, you cannot be detected by a directional scan. To easily confirm that, warp to your safe spot and use your directional scanner at maximum range. If you find nothing, nothing is in directional scan range. Never warp to within 'zero' of your safe spot, and always move rather than sitting still. This will reduce your chance of being detected or compromising your safe spot location. Catching a good point somewhere close to the middle is difficult using the normal space view. Switch to the 'map' screen. Observe the celestial objects and define the most deviated alignments in different axes to create your mid-points. As soon as you initiate warp to your target, watch your location closely and catch a good mid-point from the map screen. Because your velocity varies during the warp sequence, if you do not check your map screen, you will end up very close to the celestial. Unaligned safe spots are pretty safe, but there is always a chance that you could be pinpointed by probe scanning. The longer you stay in a safe spot, the chance of being pinpointed increases exponentially. Even if you are far away from any celestials and out of maximum on-board scanning range, your existence could be confirmed by your appearance in the local chat channels in high and low security space. Observation bookmarks are used for tactical observation of star bases, POS, and gates. Before you warp to a gate or a base, you may want to scan and check your destination from an off-grid location for any camps or targets you are hunting. In this situation, observation bookmarks are used to scan the destination for possible targets or camps from a safe distance. Tactical Bookmarks around a station represent an important category of Observation Bookmarks. When entering a new system for the first time, you should build a simple library of bookmarks around your home station. Ideally, you should fit a fast frigate to establish the bookmarks. Three "Insta-Undocks" (One on-grid, one off-grid, and one that "bends the grid"). Two bookmarks that represent Insta-DOCKs immediately above and below the station. Two more bookmarks further above and below the station, respectively. Two bookmarks to the left and right (port and starboard) of the undock path, respectively. Two red bookmarks immediately behind the undock path. One "safe spot" bookmark at an off grid spot situated in a random direction away from the station. To do this properly, it should take a UNISTA about 30 minutes. However, once established, a UNISTA can now warp around the area at ease using this collection of tactical bookmarks. Once you have established this collection of bookmarks around a station, you can extend the thinking to key stargates within the system. The "high ground" of a stargate is either the path that is furthest away from the sun or furthest away from your home station. 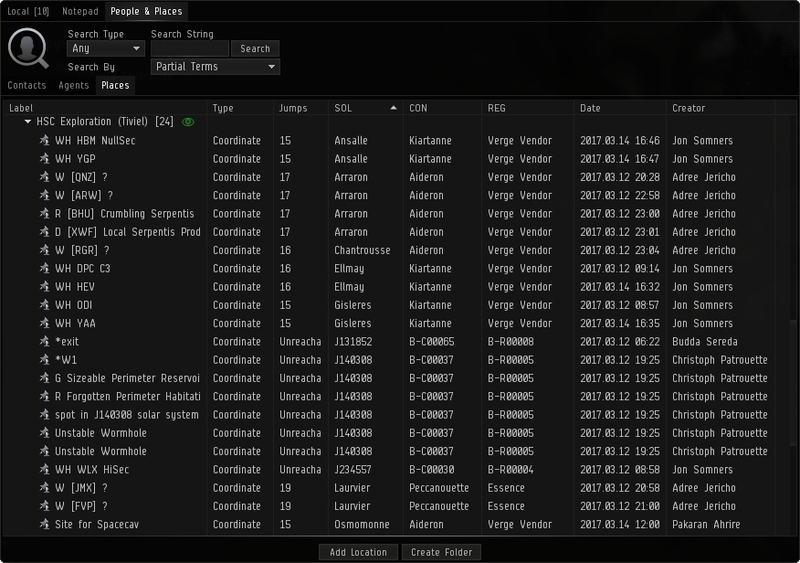 In the same layout as the Observation Bookmarks, one can use Tactical Bookmarks for a PvP usage in Low Security Systems, Null Sec Systems and Wormhole Space. The recommended layout for a Tactical PvP Bookmark Setup is the classic 3 axes, 4 point per axes, with 150km separating each Bookmark Point. With this layout, a Fleet Commander, or yourself, can warp to various different positions depending on the situation and the fleets compositions. With this layout, almost every point around a designated area (eg. Jump Gate, POS, Station...) in a radius of 300km can be reached, allowing fast position changes as well as the famous "50km Warp" known to be the smallest distance a ship can warp to. The fastest way to create a Tactically Bookmarked Location would be the combined use of Micro Jump Drives (MJD) and Micro Warp Drives (MWD), although it was rarely used in the middle of a fleet fight, these could allow fast creation of such Bookmarks in those situations. The recommended layout for a Tactical PvP Bookmark Setup is the classic 3 axes, 4 point per axes, with 150km separating each Bookmark Point. This creates 12 points that can be warped to from any other point in the layout. Because that ship cannot warp if the target location is closer than 150km range, it is recommended to even make them at a little more than 150km. More Points in the layout allows more mobility and precision to the desired warp location. The 150km minimum range doesn't apply to the "Warp at..." option, allowing a pilot to make a 50km warp if warping to a target location at 150km range using the "Warp at 100km" option. Because of the fact that there are 7 "Warp at..." options, a pilot or a Fleet Commander can virtually arrive at any locations inside the Tactically Bookmarked Location. Also, beside the realigning time, there is no cooldown on the warp, this allows pilots to move freely between the different layout points to get closer, or farther, to their targets upon landing. Using Warp instead of a MWD, for anything bigger than a destroyer, is faster for distances above 50km on most of the situations, making Tactical Bookmarks a more important tool for non-frigates. The gif belows shows a classic double warp use of the tactical bookmarks to reach a target. In general, solar systems mostly rest on a plane. Try to create observation points perpendicular to the alignment of this plane (above and below). This will reduce the probability of being detected by chance. As time goes by you will create a lot of bookmarks and if you don’t organize and manage them, you will mess them up. This section presents some basic techniques you can use to avoid that. The following are not strict rules. They are, however, built upon solid experience. In time, you should feel free to develop your own style and system. The most important part of organizing your bookmarks is labeling. In stressful situations, you have to be able to recognize the right bookmark and use it in an instant. Therefore, your bookmark labels need to have a standard, easily recognizable format. It is important to create - and use - an efficient way to label your bookmarks from the beginning. You will thank yourself in the future. You may also use folders to organize your bookmarks. Before labeling your bookmarks, you should familiarize yourself with the information stored with your bookmarks in the Places tab of the People & Places window. Avoid using these details in your bookmarks to simplify their labels. Also, you can arrange the location of the columns according to your choice. In this subsection we will discuss and summarize the Agony Unleashed style. This style may seem a bit complex at first, but after some practice it becomes very clear and easy to recognize and use. This is not a complete documentation of the style - please refer to the original article for details. Apart from the brackets, the style uses two special symbols. The @ symbol is used to describe distance from the preceding object, and the % symbol is used to describe the alignment of the bookmark. This follows the same general pattern as the Agony style where you always have the four key elements in the bookmark name. But instead of using symbols like ">label<" or "|-label-|", you stick with short character prefixes to define the bookmark type. As with the Agony system, bookmarks should be sorted into folders based on the type of the bookmark. Over the long term, sorting into folders by type will make the most sense because the game will filter out any bookmarks that are not in the current solar system. By putting the "type" identifier at the front of the name, you can easily sort your bookmarks back into folders (such as if you lose your local settings file). For example, every bookmark that is prefixed as "GOG" goes in the "Gate (Off-Grid)" folder. The alignment notation can be done in a variety of ways, but is generally done in relationship to the star. Pretend that you are standing at the star and looking towards the gate. This gives you left / right / high / low / near / far. Or you could just use letters like: L (Left) / R (Right) / T (Top) / B (Bottom) / N (Near) / F (Far). Sometimes the alignment can be omitted (in the case of favorite stations, or insta-warp undocks). AB Belt Bookmarks inside of asteroid belts that allow mining ships to get within 2-4 kilometers of a section of the asteroid arc. Saves time instead of slow-boating the 15-20km from the warp-in point for the belt. ABO Belt (Obsv) Asteroid belt observation bookmarks are usually used by support craft such as haulers. Typically above/below the belt so that haulers can warp in/out without bumping mining craft (jetcans get tractored to the location by haulers). They can also be used by mining ships in NULL sec. It is never a good idea to warp direct to a belt as hostile pilots can appear in local and be on grid before you arrive at the belt. It is safer to warp to the bookmark first and then onto your preferred position in the belt. GO Gate Gate observation bookmarks that are the same grid as the gate. Observation bookmarks are generally at least 200-250km away from the gate, while tactical bookmarks are generally within 150km. You should have at least 1 observation bookmark for every gate that you pass through on a regular basis, and it should be off to the sides, out of alignment with any major celestial. Gates where you travel through frequently should have multiple bookmarks for safety / flexibility. GOG Gate (Off-Grid) Off-grid gate bookmarks are generally done at 1000-5000km away from the gate and possibly as far as 1.0 AU. The purpose of an off-grid bookmark is to partially hide your fleet numbers from the opposition rather then sitting on a gate. Or it can be used to stop short of warping to the gate, allowing you to do a quick d-scan of the gate before going through a gate. Off-grid bookmarks should always be made in a direction not aligned with any major celestial object (stations / gates / planets / moons). GT Gate (Tactical) Tactical bookmarks around gates are typically within 150km and are used as warp-in points for ships that want to land at a gate at their optimal ranges. However, in a pinch, you can just bounce to a gate observation bookmark then back to the gate at your optimal range. JB Jump Bridge Jump bridges are used in sovereign null-sec systems to move from one system to another without using a jump drive or star gates. Most corporations will have pre-existing bookmarks defined. JBO Jump Br (Obsv) Observational bookmark at a distance more then 200km from the jump bridge. 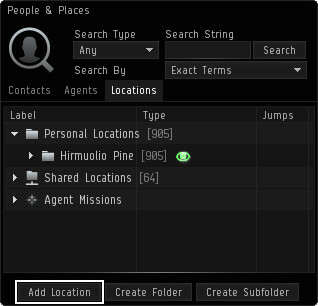 LOC Locator Agent Stations where you have standings to use locator agents should be bookmarked. The reason that you bookmark these and put them in their own folder is so that you have a quick way to figure out if any L3/L4 locator agents are within N jumps of your current position. You should include the station abbreviation, planet/moon, and the level of the locator agent. Only L3/L4 agents are generally worth bookmarking as the L1/L2 agents are much more limited and/or too slow. P# Planet (Obsv) Planet warp-in grid observation points. PO POS Tower By creating bookmarks for the moons in a system, you can get on-grid with the POS, hopefully from an unexpected angle and in a grid corner where you won't be uncloaked. It's optional whether you include the corp/alliance that owns the tower as that information can change frequently. POG POS Tower (Off-Grid) Off-grid bookmarks at moon locations where POS towers can be found, so that you can stage assets near a tower without being on the same grid. SF Station (Favs) It can be useful to bookmark stations that you use frequently, so that you don't have to dig through the list in a multiple station system. And you can tag the stations with comments so that you know why you bookmarked a particular station. SFR Station (Refining) For industrial folks, it is very useful to make special bookmarks for stations where you have zero-tax standing and the station has 50% refine facilities. Just like with locator agent stations, you can open up your folder of refining stations and sort by jump distance to see what is close to your current location. 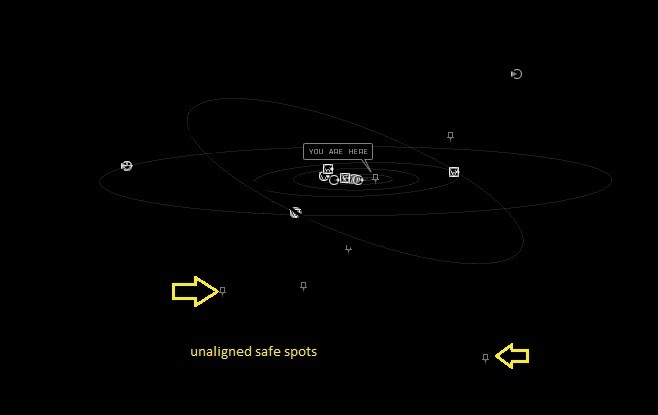 SS Safe-Spot Safe-spots are locations in space, not between any major celestial objects where you can hole up for 30-60 seconds without sitting at a station / gate / planet. These are typically within 15AU of any major celestial (see "SSD" for deep safe spots). Distance (if noted) should be the distance to the closest major celestial object. SSD Safe-Spot (Deep) Deep safe spots are those which are 15AU or more away from any celestial object. More secure deep safe spots are also at least 15AU away from any line of travel between major celestial objects (gates / stations). The goal with a deep safe-spot is to never appear on the directional scanner of someone who is hunting you by moving from celestial to celestial. SSX Safe-Spot (Burned) Safe-spots that have been shared with other people or where someone has landed on-grid with you should be considered "burned" and marked accordingly. SSZ Safe-Spot (Temporary) Temporary safe spots are those that you drop quickly, but don't categorize. Often named by just putting the EVE time or the nearest celestial. STO Station (Obsv) Station observation bookmarks are those on-grid with the station, but at least 200-250km away from it (or the undock point). These are used by covert operations pilots who want to get a quick peek at a station's undock activity without running the risk of discovery. STOG Station (Off-Grid) Off-grid bookmarks for stations. Good for setting up a pounce fleet where you are going to warp to the undock point. STU Station (Undock) Bookmarks that will place you (or your fleet) right on top of the undock point, or within a few kilometers of the undock point. UD Undock Instant warp-off or an undock bookmark. These are always created in as straight of a line as possible from the undock point on a station at a distance of 2000-8000km. When you undock, you right-click on the bookmark and warp to it. If the alignment is close to your existing alignment you will warp off before anyone can bump you or tackle you. Since alignment doesn't matter, typically you only record the distance. ZZ ZZTemp Temporary or unsorted bookmarks should have a home. These can be pretty much anything and everything where you don't plan on keeping the bookmark long-term. Define your own style and stick with it to avoid any future confusion between your bookmarks! Try not to use information already available in the Places tab for bookmark labels, and keep it as simple as possible because you may need to find your bookmark in an instant in case of an emergency or a strict situation. You can sort your bookmarks according to their jump distance. This way they will be available on top of the list. The bookmarks in the current system are always highlighted with green to help you separate them from the others. You may reach your bookmarks through the right-click menu while in space. Only the bookmarks in the current system will show up in this menu. Using folders is the simplest way to organize your bookmarks. You can use folders to arrange your bookmarks according to your individual style. You also use the folders to choose whether to display a folder's bookmarks in space or not. Clicking the eye icon sets visibility. Green means visible, grey means hidden. Bookmarks in the root folder (not in any of your folders) are extremely easy to access in space - use this to your advantage. If you would like to keep just one bookmark folder open from your People and Places just double click on the folder you want and a copy will be created on your screen and you will be able to close the People and Places tab and the fold you choose will remain. You can share your bookmarks with others in-game, but in most situations this is not recommended. Acquiring bookmarks is difficult, and if you share your safespots they will become public and compromised. If you share your bookmarks with your corpmates consider these as being compromised. To copy your bookmarks, open the Places tab and select all the bookmarks you want to copy. Multiple selections can be made by using the shift key for in-between selection or ctrl for one-by-one selection - however, you can only copy ten at a time. You can only copy your bookmarks to your station hangar or cargo hold. To COPY your bookmarks, hold the SHIFT key while clicking and dragging the bookmarks to your hangar or the ship's hold. To MOVE your bookmarks, hold the CTRL key as you drag the bookmarks to your hangar. If you are finding the bookmark isn't copying or moving, when clicking on your bookmark, you need to select the white space at the front or the end of the bookmark. You can also share bookmarks with other corporate members in the Corporate Locations under the Places tab in the People & Places tab on your NeoCom. Any corporate member can create a folder or a bookmark but each addition will log the creators name. In addition, only a corporate member with the 'Communications Officer' role (in EVE University the Sophomore title provides this role) can delete a corporate bookmark. To create a bookmark in Corporate locations just create a personnel bookmark like you normally would then just drag the location down into the corporate folder that you want to place it in. Please be sure to limit the number of bookmarks, as there is a cap of 500. And there are other campuses, and projects that will need them. If you copy or move a bookmark into your hanger you no longer need, you will not be able to delete it directly from your hangar. You will need to move it back to your Personal Locations. Once in your Personal Locations you can then right click and select "remove location" from the menu. It would be ideal to setup a separate folder for this. Deleting a copied bookmark will not delete the original if you have multiples of the same bookmark. 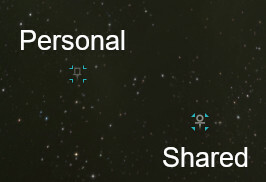 You can share your bookmarks through trade and contracting in a station or through cans in space. Once you receive bookmarks you will see them in your cargo hold or Items window. Dragging and dropping them into your Places tab will add them to your bookmarks. If you think that a bookmark may be compromised, or you share it with your mates and then separate from them for any reason, just trash it. Also trash the bookmarks you used with a fleet, because everyone in that fleet learned them. Paranoia can be very healthy in this regard. You can recycle your compromised or old bookmarks. Use the mid-safe technique that was described above in the safespot section, but this time use your safespots rather than celestials to take mid-points. In this way you will be able to generate more unaligned safespots from your older ones. Corp bookmarks are designed such that anyone in your corporation can read and create bookmarks, although special roles are required to delete bookmarks. Only those with the Communications Officer role can delete and otherwise manage bookmarks listed in the corp bookmarks are. Corporation bookmarks are limited to 500 so using these bookmarks in larger corporations require some guidelines. In general, the following should be observed when creating and deleting bookmarks in corporation bookmark folder areas in order to manage large numbers of players who wish to store bookmarks. 1) When in doubt, always use your personal bookmark folder for bookmarks. The corp bookmark folder is not an "overflow" for your own personal bookmarks. Corporation bookmarks are there for use by fleets and special locations that are important for a substantial set of members for your corporation. When creating a bookmark here, you should ask yourself, is it necessary for everyone in the corp to view this? 2) If you are creating bookmarks in the corporate folder, be sure to use a good descriptive name for the folder and the bookmarks. IF you simply label the folder as "temporary" then someone is going to delete them. It is much better to start with a name like "XYZ fleet" then change it to "Delete" when you are done with them. 3) Always be responsible for your own bookmarks in corporation bookmarks. If you add some and no longer need them, please delete them. Occasionally, the corporation bookmark folder may become full. At this point, it is important to consider several issues when deleting bookmarks to add more. Look at where the bookmark is located. Bookmarks not in any folders are probably mistakes. Look in your group's folder. 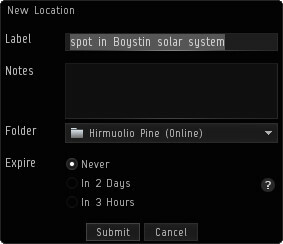 If you are in solitude, go there first to delete BMs. Finally, if you cannot find any start looking outside your own group. Which ones MIGHT be candidates for deletion? Bookmarks that YOU MADE are the easiest if you can delete them. Bookmarks that are OLD AND FOR DYNAMIC SITES are more likely to be candidates for deletions. For example, a two day old wormhole location is most likely no longer there, so can usually be deleted safely. OK, I found some I think can be deleted, now what? Check WHO created the bookmarks. Are they online? Can you check in mumble if they need them? Check in Chat.E-Uni if the bookmarks are needed. When in doubt, probably better to leave them and find some different ones to delete. In general, just use common sense. 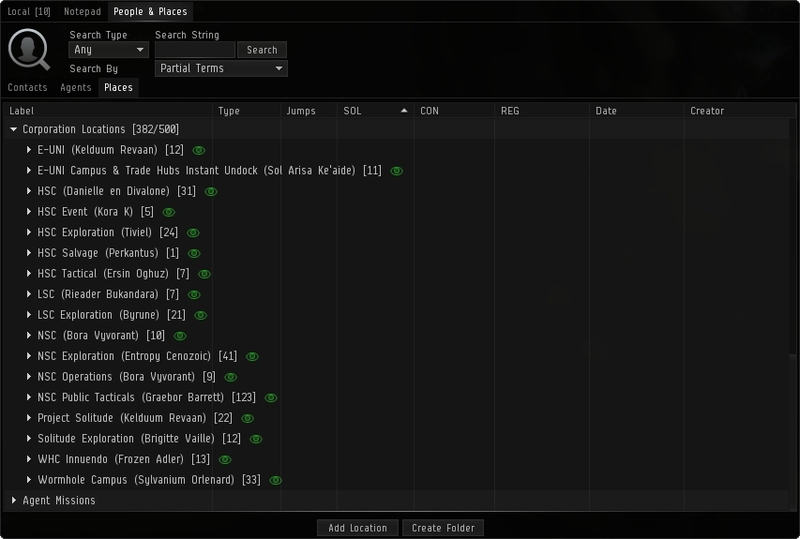 Whatever role you carry out in EVE, bookmarking is one of the most important aspects of the game. Although it seems very tiresome, at least if you want to survive and avoid dangers, you should create the basic bookmarks for your own safety. If you are considering PvP or military action, you must at least create these bookmarks for your operation area. Your survival in low sec and Null sec, highly depends on your bookmarks and your personal skill to use them. Always remember that bookmarking requires no additional game skill, it’s just a time consuming action. If you start bookmarking in the early days in your game life and spend few hours every week or month, you will cover most of your operation area in few months. Each time you run for an agent mission, hauling something, docking and undocking a station, approaching a gate and flying with a fleet, try taking some time and creating some bookmarks. If you use all the opportunities, it is much easier than it seems. This page was last modified on 18 March 2019, at 06:52. This page has been accessed 366,511 times.